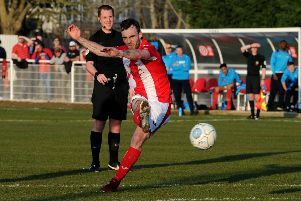 Following his side’s win at fellow strugglers Hednesford Town, Brackley Town boss Kevin Wilkin has appealed to supporters and the town to get behind his team in the coming weeks. Saturday’s win moved Saints out of the bottom three of the Vanarama National League North table. Another away clash at Lowestoft Town on Saturday is followed by a home game against Bradford Park Avenue. The club has designated this match as free entry for all spectators and Wilkin is hoping for a bumper crowd to support the team. Admission against Bradford on Saturday, March 12 is free and all spectators will receive a voucher for half-price admission to the home game against AFC Fylde on Saturday, April 2. He said: “It is in our own hands but it is all very tight down around the bottom of the table. The win at Hednesford against another team in the relegation places meant it was almost worth more than just the three points.